EXIM Extends Assistance Measures to U.S. Exporters in Federal Disaster Areas Affected by Midwest Flooding. EXIM Bank can ensure you collect when you insure your exports. EXIM Bank financing can help keep your export business from drying up. Learn how EXIM can equip your export company to compete abroad and win sales on the quality of your product. Learn how to develop an export business strategy, receive international foreign exchange payment information and more. Our office supports and keeps elected officials and their staff informed on how we support American jobs by financing U.S. exports. We also respond to Congressional concerns, and help elected officials educate their constituents on EXIM financing tools through hosting local events. Get Fact Sheets, Reports, and Contact our Office. 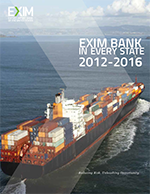 EXIM Bank is active in every state in the U.S. This report provides details, statistics, and success stories that provide insight into how we’re helping exporters on a state level. Plan for Orderly Termination of EXIM Bank Operations in the Event of Failure to Enact Regular Appropriations or a Continuing Resolution. The numbers for FY 2016 are in and the Facts About EXIM page has been updated.